WOW!!! I am SO ENJOYING your video’s on the Glimmer Foiling Machine, Yanna!!!! LOVE the results! I am subscribed to your blog, so I figure I won’t miss anything on this new machine! TOTALLY LOVING THIS! I’ve put this on my list for Santa! 😉 SOOO GORGEOUS!!!!!!!!!!!!!!!!!!! Wow, absolutely gorgeous foiled cards–such details! Dear Yana, I always watch your videos and I remember you mentioning on a previous one how much you love to foil. I’m the same and I can only dream about hot foiling with those amazing Spellbinders products. The results are unique. Love the cards. Great choice of colors. What a great, new product! Yana, your card is gorgeous and so quick to make. Love it! These cards are gorgeous! 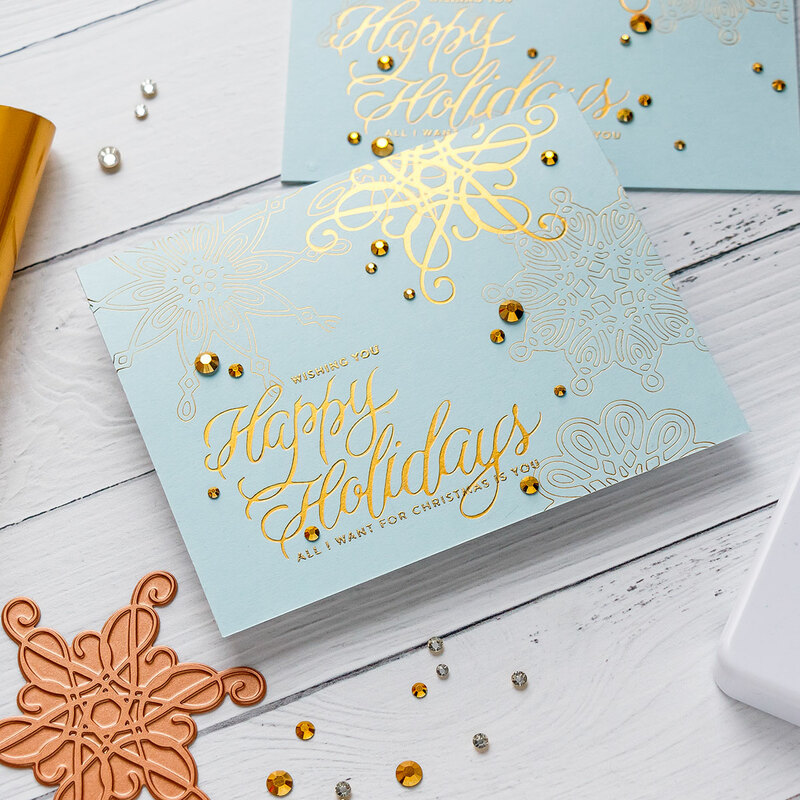 Love the way you combine the foiling system with heat embossing to expand your designs. Your card is so beautiful! I’m going to have to add this foiling machine to my wishlist. Your foiling is gorgeous! This awesome machine is going on my wish list for Santa! Thanks for the great informative and creative inspiration. Wow I have not seen this foiling machine and love the idea. Love the idea you don’t need to get certain dies in order to foil. Thanks for the video your card is beautiful. Wow, these are so beautiful Yana! This machine is definitely going onto my holiday wish list! Thanks for the wonderful video and gorgeous card inspiration. So pretty! Love this foiling machine! luv the bonus letterpress effect! Lovely, elegant card! Love this foiling technique. What beautiful results! It looks like lots of fun, but it will have to take a backseat on my wish list. My budget won’t allow for it right now, but the effect is stunning. Elegant card! So many exciting possibilities with this Glimmer Hot Foil system! Love all the fabulous samples along the hop! Beautiful card! I love the foil machine. I hope Santa brings me one! I love this card design, so elegant! I’m super excited to give this a try! 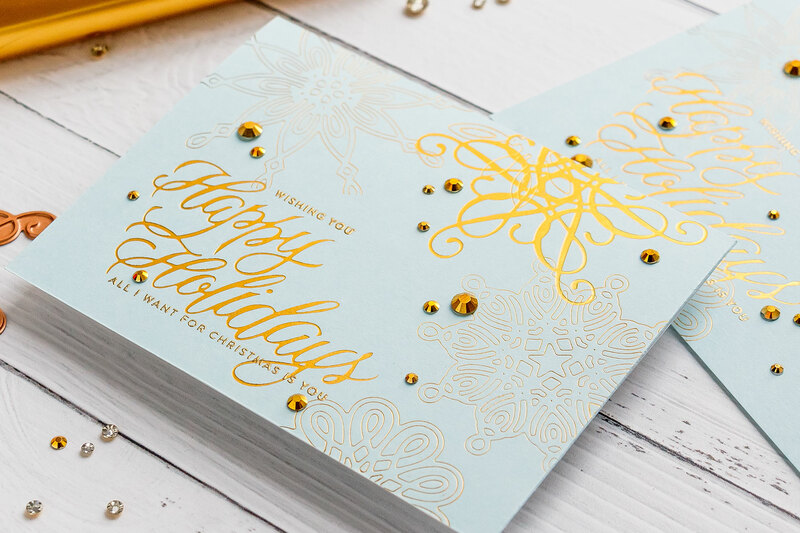 These cards are so elegant with this simple color palette. Thanks for sharing your creativity. 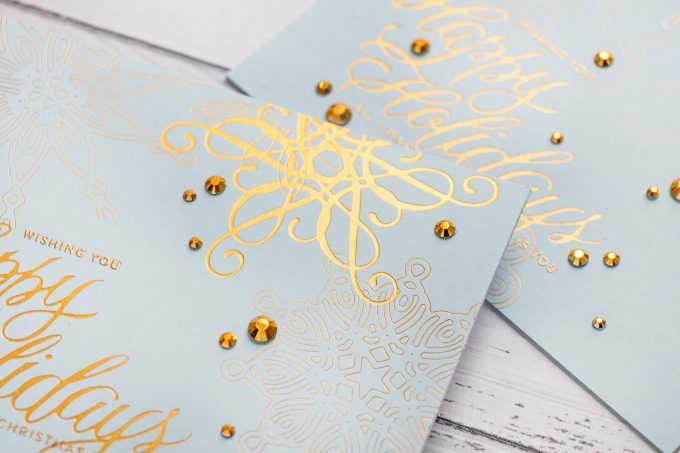 Love the colors on your foiled Christmas card! So elegant and pretty! Stunning card! Thanks for your video very informative and oh the possibilities! So pretty! 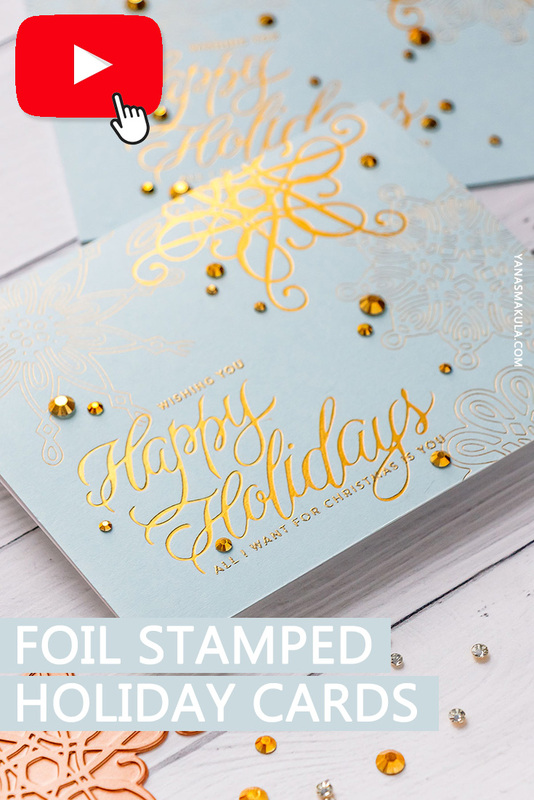 You’re probably correct about embossing AFTER foiling. Yana, this is so beautiful! I love love love the colors on this. Those jewels add the perfect bling! The results of this are just jaw dropping! So elegant! oooh! might need to put this little foiling machine on my Christmas list. Your cards are amazing! Wow!!! Sooooo Beautiful and Elegant!!!! 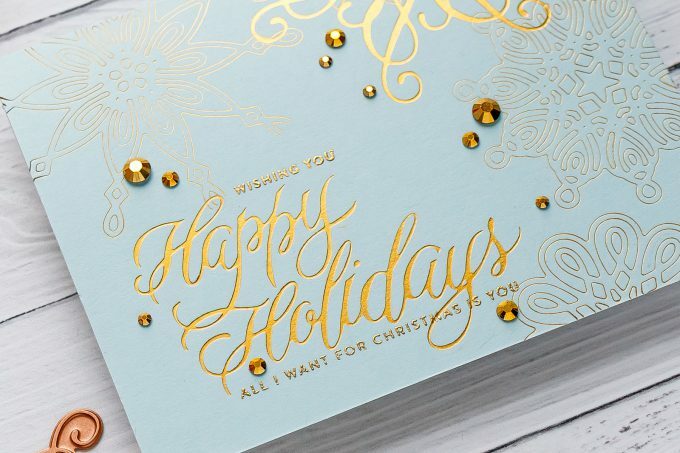 Beautiful Beautiful Happy Holidays Card! I subscribe to all your outlets because your talent inspires me so. You can take something simple and make it so elegant. Your use of Spellbinders Glimmer hot foil plates really makes this card POP! Thank you for your inspiration! 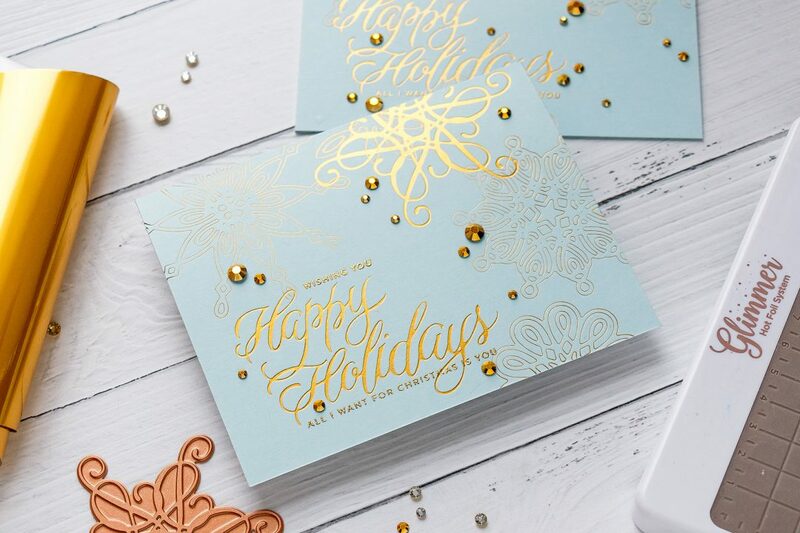 Love that you combined the hot foil plates with regular dies and even heat embossing, Yana! So many things you ca do with this new machine. This is gorgeous! The foiling is very pretty against the light blue background. I soooo want this machine!! These cards look SO professional!! AMAZING!! What a beautiful card! Amazing. Beautiful card! Great color choice, pretty design layout, and I love the combination of the thin line images with the bolder image and sentiment. Oh be still my heart…..this card is stunning. Love the soft blue and the gold together. Really festive. Thanks for sharing this and for another great video. 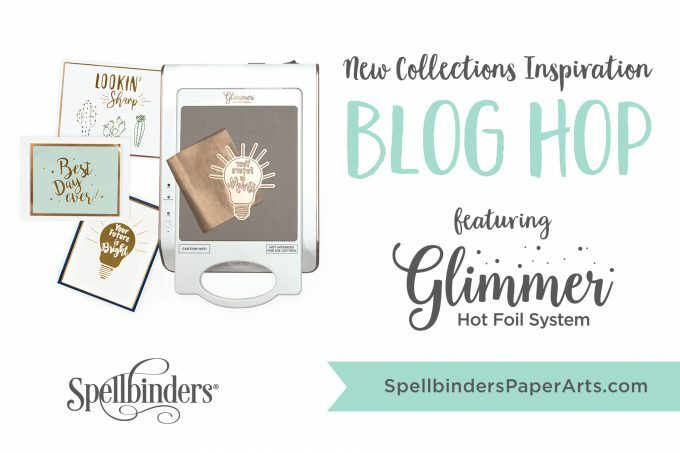 All I want for Christmas is you, Spellbinders Glimmer Hot Foil Machine. Awesome! Love your elegant card. Such an elegant card! I love that you can foil and then foil again without ruining the original foiling and that the system also debosses. Thanks for sharing! This system is definitely going on my wishlist! I am not sure I would have thought about adding embossing, but it’s good to know you need to think about what the hot plate will do if you start with that!! It does make perfect sense, but I don’t always think through a project when I start! Thank you. So elegant with the foiling! Your card is so elegant, in fact it is MUY ELEGANTE!!!!!!!!! I like how you made the design go off of the edge. The gold on aqua is a great color combo. I wouldn’t have thought of it. Great job.